← Embracing Life, the latest from The Studio and my disaster…. I shouldn’t have been surprised but over the summer, far from getting quiet, the Art Academy was a hive of activity. I was only there for a day for this special class with Christy Symington – but the summer school programmes meant it was business as usual at College, which is great – the buzz was still there. Now, back to the point. 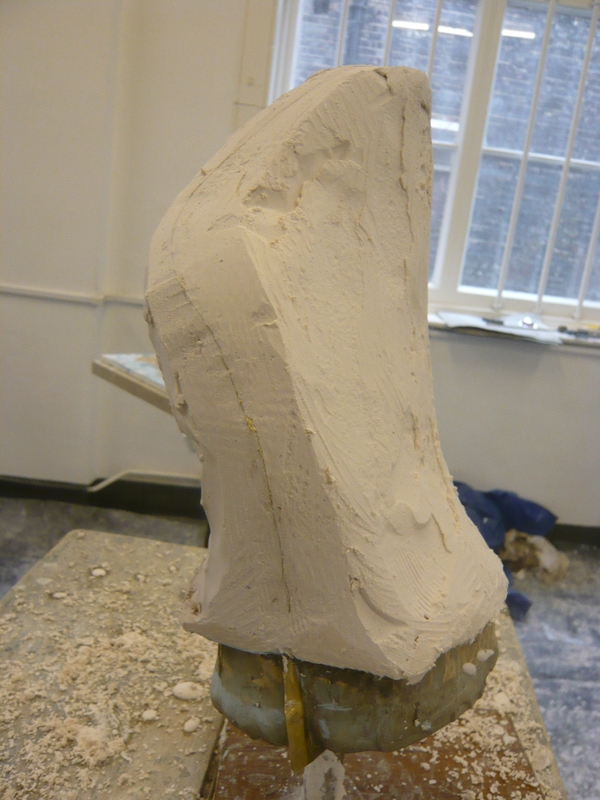 This one day class was in waste mould making – essentially this is a way of making a one-off cast from an original sculpture. It’s called a ‘waste’ mould as it can be used only once since it is destroyed in the final stage when the plaster copy is revealed. For this reason, it’s a technique not often used but nevertheless is a good one to know and the skills developed come in useful for other types of mould making. Where a number of editions are required the moulds used incorporate a flexible layer of rubber so that they can be re-used – more on this later in the year. 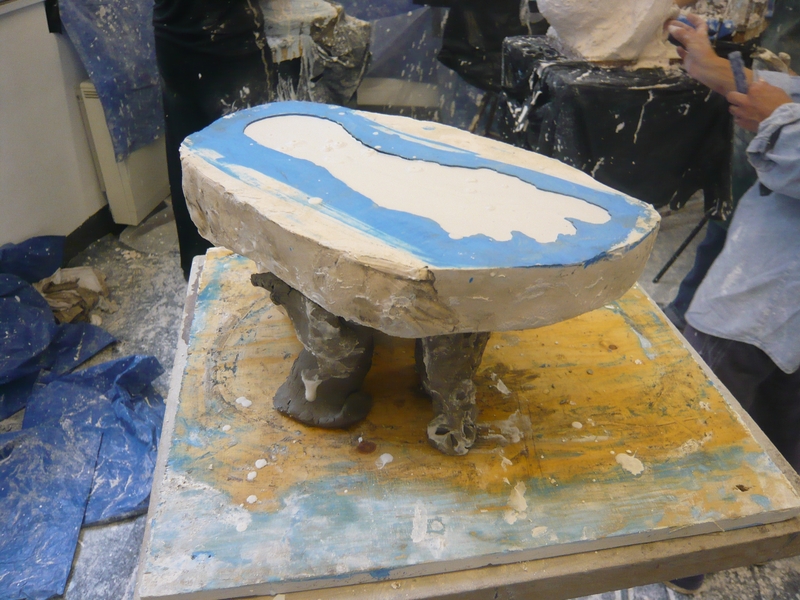 I decided to do 2, a foot, needing only a one piece mould and a hand, being more complicated, a two piece mould. You can see that the foot (above left) has been covered in layers of plaster after a clay wall was first built around it to contain the plaster. Before the plaster you can see was layered on, a thin layer of coloured plaster was applied to the clay original (you’ll see why later). The hand has metal shims inserted into it where the join in the mould will be and a clay wall base, again to contain the plaster. 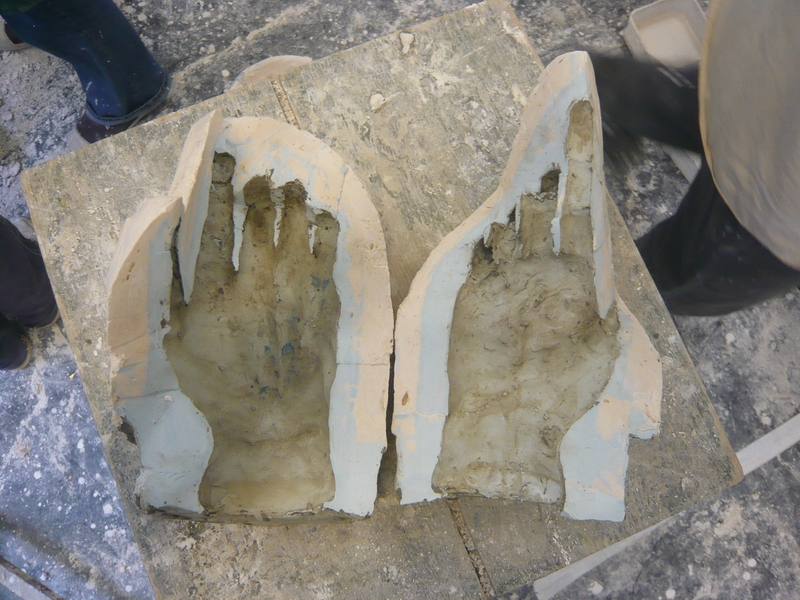 The image left shows the hand after layer upon layer of plaster has been splashed onto it – again after the original coloured base layer has been applied. 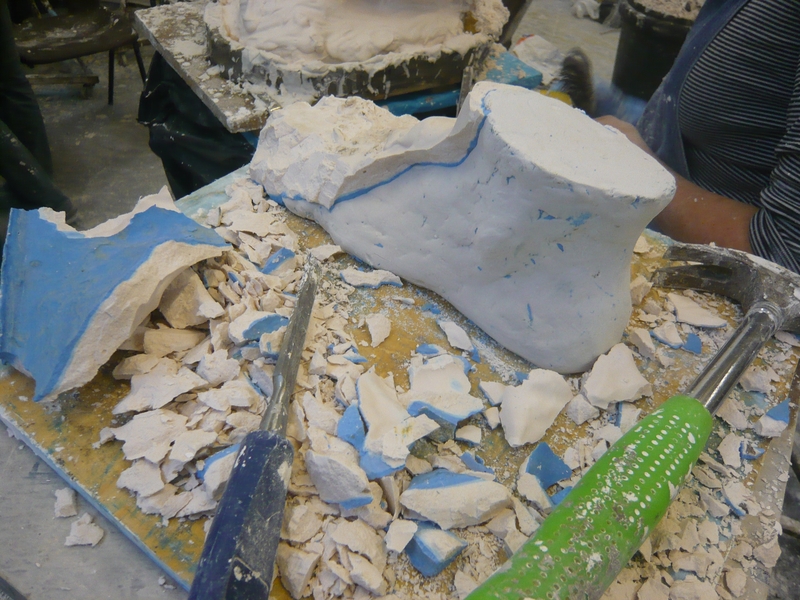 The two halves of the mould are cracked apart using a hammer and chisel once the plaster is totally dry and the mould then ‘demoulded’ – that is the soft clay original sculpture is removed by carefully scooping it out. 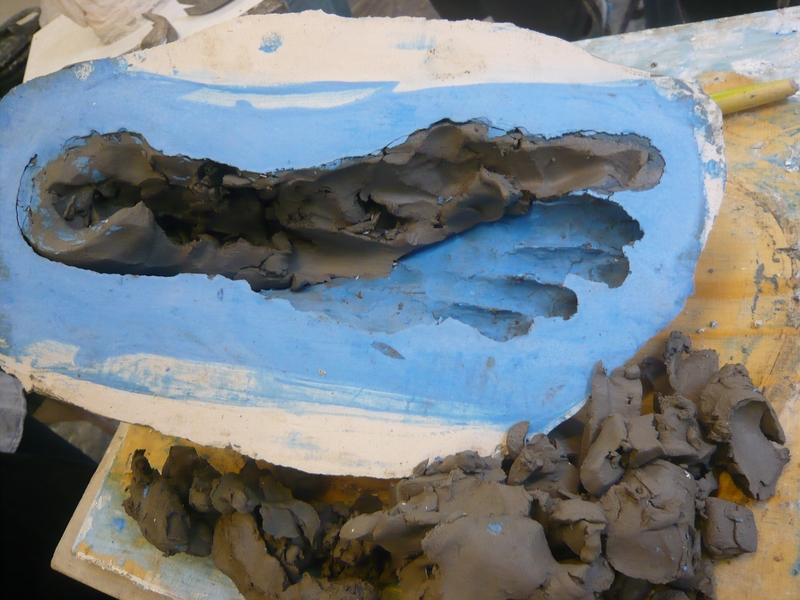 The image to the left shows the clay part scooped out and also the thin inner blue layer of plaster. 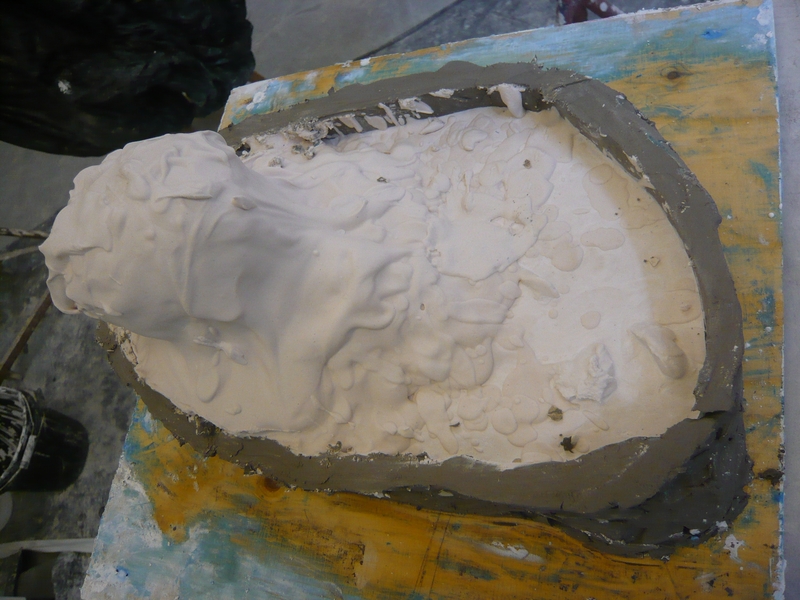 Once the clay has been removed, the mould is cleaned thoroughly with water. Before plaster can be poured into it to make a cast an oily releasing agent is applied to prevent the fresh plaster from sticking to the mould. You can see the freshly poured plaster in the mould below left. See how the mould has been held in place by clay supports . Below right you can see how the waste mould gets chipped away with a hammer and chisel to reveal the cast within. The blue layer indicates when you have reached the cast. This part is great fun! 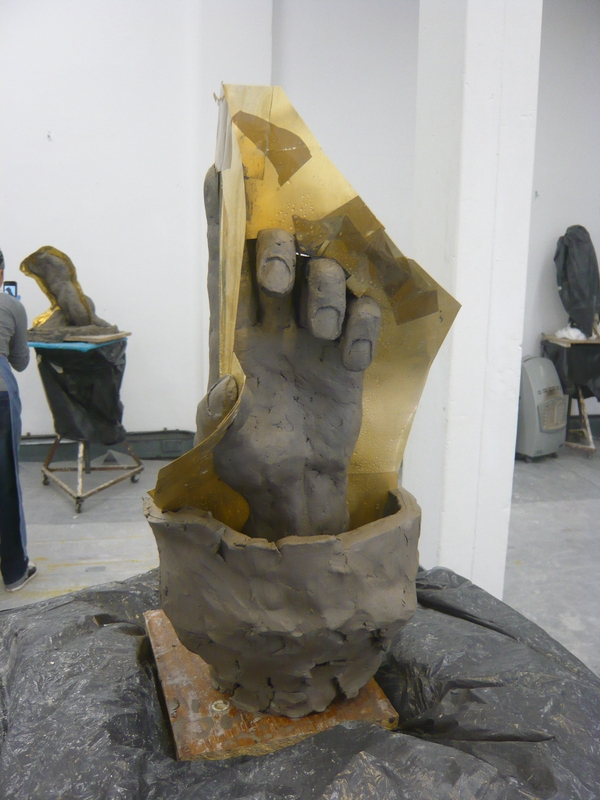 I haven’t cast the hand yet but I’m looking forward to it…. This entry was posted in figurative sculpture, gary scott blog, hand portrait, sculpture blog, Uncategorized and tagged figurative sculpture, gary scott, gary scott sculptor, gary scott sculpture, hand portrait. Bookmark the permalink.